The B14 Flying Circus arrived at Stokes bay to be greeted by grey seas and 30+ knot winds, peaking at 40 knots around 1300. With the predicted forecast for Friday and Sunday, some chose not to make the trip. What a day they were to miss. After being held ashore under AP, the fleet was advised that they were going to sea at 1530. The first few boats tentatively launched into 25 knots that was fast reducing to 20+knots with gusts from the SW. After 30 minutes, the start sequence started. With several boats opting to sit this one out, the protagonists lined up for a fast charge round the bay. 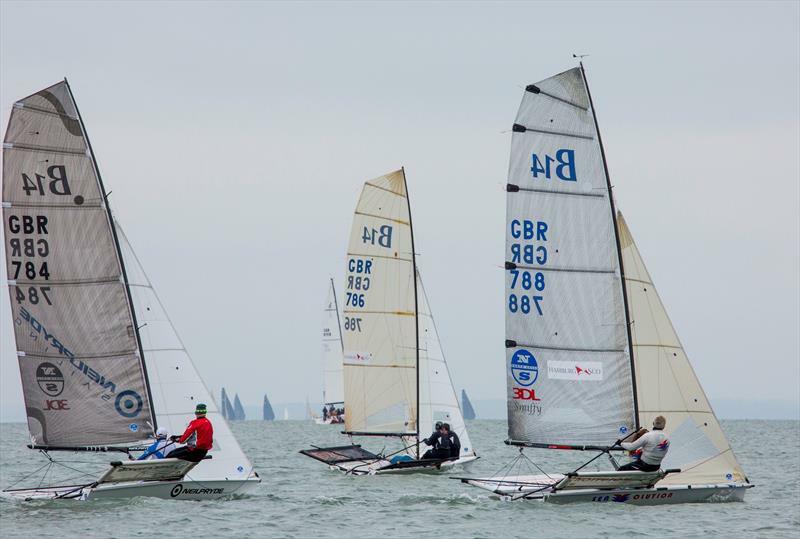 May 29th will see the B14 fleet descend on Stokes Bay SC for one of the most competitive National Championships in recent years. A quick review of entries suggests that there is a strong top group with a few others within the fleet capable of upsetting the order. Friday and Sunday look likely to produce big breeze. Schedule is for 9 50 minute races over 3 days with a maximum of 4 per day. So it could be a game of attrition. So those that did attend, were treated to flatish water and SW 8 – 15 knots, unlike the promised breeze the heavier bomber command teams had been salivating over and enjoying a hearty week, found they were going to have their hands full with the lighter teams. Reminder it's the inland championships at Datchet this coming weekend. With an earlier than usual date for the Inlands it looks like a rather unusual event for us.. Warm and 8-15 knots.. Not sure our brains will cope with the change but it is nice that it wont be fresh to frightening ala Queen Mary last year.